Is there a difference between total solids (TS) and total protein (TP)? VetGirl is all about using simple tools such as the refractometer to help guide your therapy, but keep in mind that the refractometer doesn't measure the TS. This means that all those years that you've been writing "PCV/TS," you were wrong. So what exactly is that handy dandy refractometer actually measuring? Modern refractometers measure total protein (TP) by the refraction produced by the total dissolved solids in plasma and have been calibrated to subtract 2.0 g/dL of the expected non-protein solids in plasma. These non-protein solids include urea, triglycerides,cholesterol, and glucose. So, TS and TP are different and should not be used interchangeably. A true TS reference interval is going to be approximately 2g/dl higher than what you are used to seeing on your refractometer: 8-11 g/dl, as non-protein solids are about 2 g/dl. While this may all boil down to semantics, it's important to understand that refractometry provides an estimate of plasma protein concentration, since protein is the major determinant of refractive index of plasma. All other dissolved solids (e.g., glucose, urea, cholesterol, triglycerides, etc) make a small contribution but are assumed to be normal and unchanged in each patient. If a plasma sample contains a large amount of non-protein solids, then the refractometer will give a falsely high total protein reading (as see clinically see with lipemic samples in pancreatitis patients!). The estimate of protein based on refractometry must then be critically evaluated in a patient with other biochemical abnormalities, as they may cause marked shifts in refractometer readings unrelated to actual plasma proteins. Thank you for the excellent, concise information! You are very welcome Brian! Please spread the word…we are getting ready for the official release soon!!! I just looked up “total solids vs. total protein” to find a good, simple explanation, and this is it! 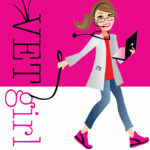 Had never heard of VetGirl before…today, I get an e-mail via LinkedIn about the launch of VetGirl’s podcast CE and the Indigogo fundraising drive. Good Luck guys, it promises to be great! Thanks, now what’s the difference between hct & pcv? LOL. Great question. One is measured by a machine, the other by hand. 🙂 Supposedly, I’ve heard that PCV is more accurate. Great article! Should be posted in all clinic labs. Thank you. Would like to see more of these.